The Shell Oil Company published a map series of the Republic of Venezuela in collaboration with Kümmerly+Frey, Switzerland. Comprised of three maps, the series covers the entire country. The available topographic resources for compiling these maps were rather scarce. 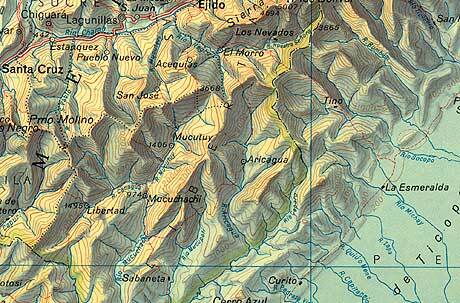 Despite this handicap, the shaded relief produced by Heinz Leuzinger is of remarkable clarity. “Republica de Venezuela” (section from map 1) compiled by “El Departemento de Topografia de la Compania Shell de Venezuela”. 6th edition 1957, 1:1 million.